Since I don't like to use the serrated jaws of my forceps to grab the line another tool was needed. 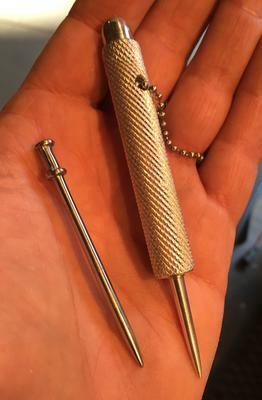 The first tool I made is a piece of aluminum with a knurled handle, a hole to add a chain and a smooth, pointed tip for picking at loops and poking through knots. It works well but is overly complicated to make for such a simple device. It then popped into my head that a nail would be a good substitute. The next generation of Pete's Knot Picker is simply an 8D duplex nail tightened into a 1/2" drill chuck which is then filed, sanded (to 320 g) and polished as shown in the photo. It works and is easy and inexpensive to make in a few minutes. Of course, any nail will work but the duplex (double headed) nail makes it a little easier to hold and gives a place to attach some kind of lanyard. I just thought I'd share the idea as I can't be the only tenkara angler that muffs casts! For at least 3 years I've carried a wooden round type tooth pick in my fly box for the same purpose. Low cost, and they float. Though in current they are soon gone. The colored ones can be easier to find if dropped on the ground. A large safety pin, pinned to yourself, accessory bag, vest, etc. works ok to, the shape making it only slightly cumbersome.